President Barack Obama wasted no time showing his support for Hillary Clinton, who announced Sunday that she would be running for president in the 2016 election. “She was a formidable candidate in 2008, she was a great supporter of mine in the general election, she was an outstanding secretary of state, she is my friend,” Obama said Saturday in Panama City one day before Clinton released a YouTube video formally announcing her candidacy. Although Clinton formally threw her hat into the ring Sunday, word got out a couple of days beforehand that she would be doing so. 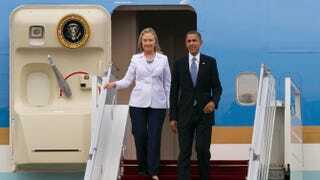 Obama fielded questions Saturday about Clinton’s readiness for the job and his thoughts on what she would bring to the table as Madam President, Raw Story reports. “I think she would be an excellent president,” Obama maintained. Obama spoke graciously about his former presidential-primary opponent and the wonderful job Clinton did as his secretary of state. He said Clinton is going to run laps around any discussions related to foreign policy. But don’t expect Obama to predict whether Vice President Joe Biden is planning to run for president. “I am not in the business of prognosticating future elections,” Obama replied when asked if Biden had plans to run again.